Nossa Cidade (“Our City”), from TheCityFix Brasil, explores critical questions for building more sustainable cities. 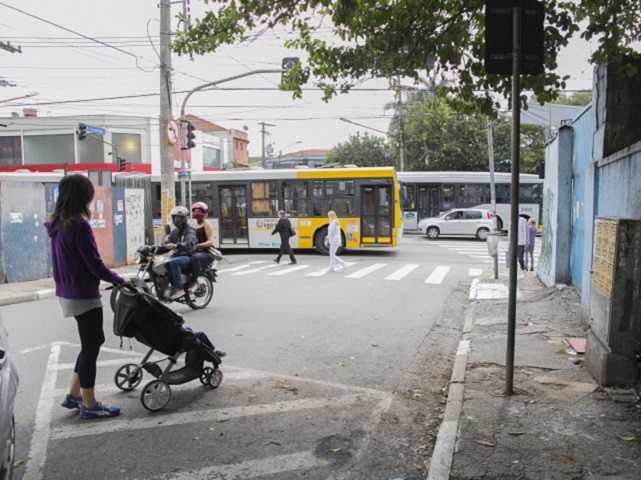 Leaning on the expertise of specialists at WRI Brasil Sustainable Cities, the series features in depth articles on urban planning, sustainable mobility, resilience, road safety and other key themes for a healthy urban environment. Each month, a new subject explores the sustainable development of our cities from a different angle. Traffic kills: every year more than one million people lose their lives in accidents, and, within just 15 years, this number could more than double, reaching 3.6 million deaths annually. In Brazilian streets, the fourth most lethal in the world, nearly 47,000 people died in 2013. This number is still growing—proof that the country is not giving road safety the attention it deserves. 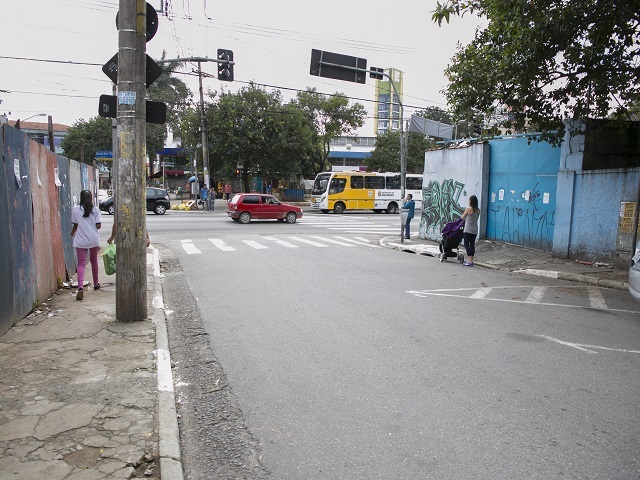 The price of road insecurity is high—16 billion reais ($5 billion USD) per year, according to the National Observatory for Road Safety—but improving road safety doesn’t have to be expensive. In July, World Resources Institute released the Portuguese version of Cities Safer by Design, a practical guide for urban planners and local governments to transform their streets into safer places for all. 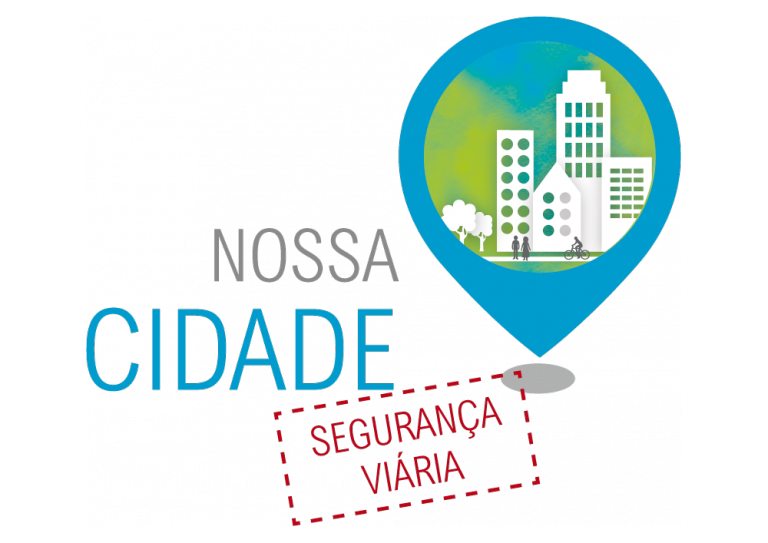 Past editions of Nossa Cidade discussed making streets safer through sound urban design principles, how accidents can be avoided with infrastructure changes and Brazil’s plans for the Decade of Action for Road Safety. 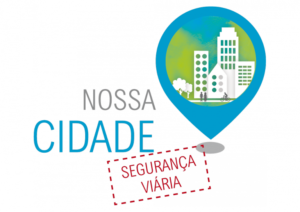 This edition of Nossa Cidade will explore São Paulo’s urban design intervention to reduce accidents and save lives. Urban design has the power to change the city. By designing cities that focus on walking and cycling, developers can create a safe and accessible urban environment. Expanding sidewalks, reducing speed limits, implementing safe crosswalks and refuge islands and creating access to public transport are some implementable measures that can help achieve this goal. One example is the city’s “Area 40” zones, where signs and built infrastructure limit car speeds and keep people safe. In São Paulo, eleven of these areas already exist, but São Miguel will be the first area to see a design overhaul, with the implementation of new infrastructure beginning later this year. The other ten areas have yet to schedule similar projects. Located in the east of São Paulo, 24 kilometers (15 miles) from the city center, São Miguel is home to approximately 370,000 people. The high concentration of department stores makes São Miguel a major center of commerce and causes an intense flow of pedestrians in the area. Many of the neighborhood streets, however, cannot support this demand—the sidewalks are narrow and often clogged, the crossing times for people are short and there are few crosswalks available. 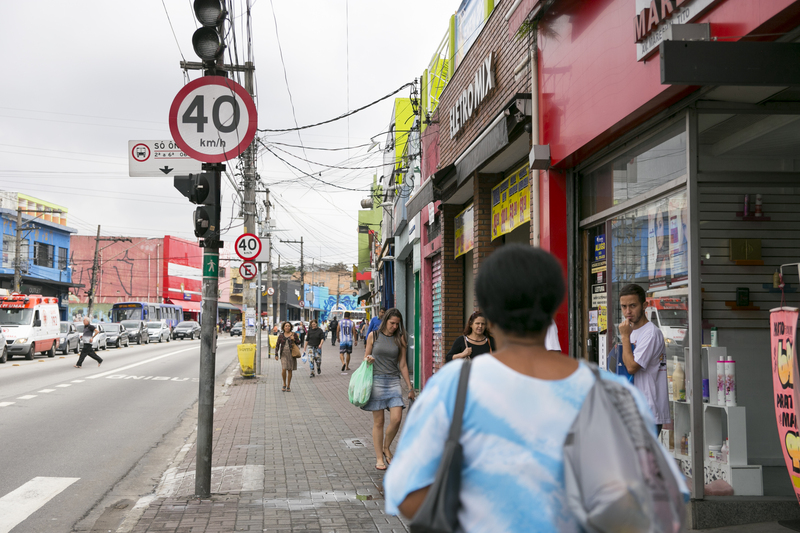 In 2015, Marechal Tito Avenue, the main street in Sao Miguel’s central zone, was considered the most deadly street in São Paulo. São Miguel needs a safer environment for all residents, especially for the most vulnerable road users: pedestrians and cyclists. 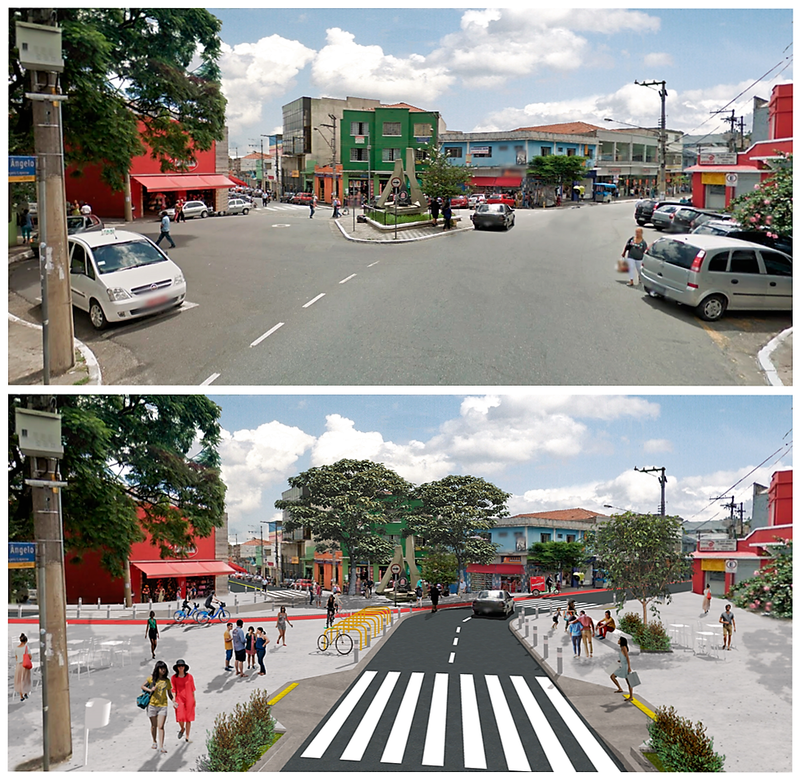 In order to facilitate this change, WRI Brasil Sustainable Cities, together with the City of São Paulo, Bloomberg Initiative for Global Road Safety by Bloomberg Philanthropies, ITDP Brasil and NACTO, is working on an urban renewal project for the central area of São Miguel. 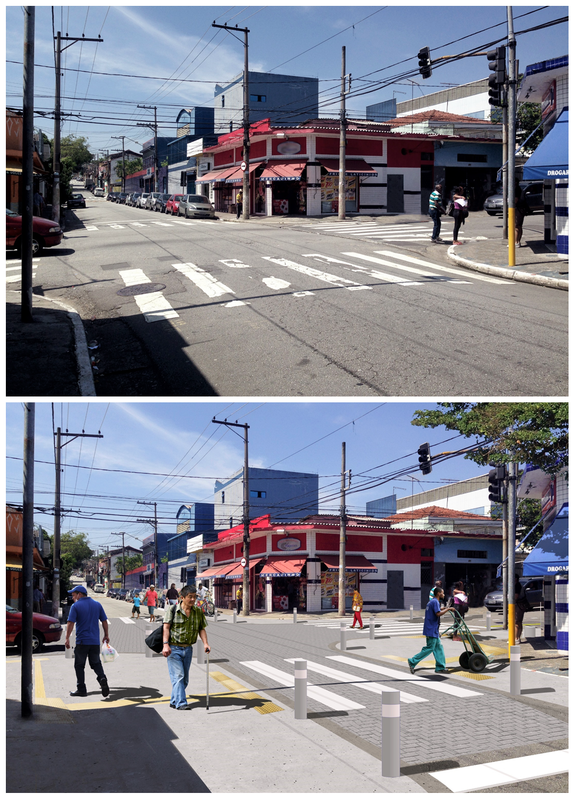 São Miguel Mais Humana (“A More Human Sao Miguel”) involves a variety of neighborhood projects, including putting in new crosswalks, revitalizing public squares, expanding sidewalks and creating new bike paths. This is a pioneer project for Latin America—no other Latin American city has developed similar proposals for as large of a space as São Miguel, which has a contiguous area of 500 thousand square meters (.2 square miles). The Mayor of São Paulo, Fernando Haddad, believes that the interventions will contribute to more diverse transport use. The mayor has also highlighted the area’s potential for revitalization and public activity: “Neighborhood centers are active, vibrant areas where many people walk every day. That’s why it is so important to focus efforts on these locations. By improving urban neighborhood centers, we are also improving people’s lives. This process improves pedestrian mobility by giving them space, and therefore their right to move and feel good in their city,” he said. The changes are an opportunity to show the local community that the city can work better for them. In an interview with WRI Brasil Sustainable Cities, Adalberto Dias de Souza, Deputy Mayor of São Miguel, said “this is the first project to be implemented in the periphery. And for São Miguel this is very important. Access to transportation, the redesign of public spaces and the reduction of accidents and deaths—these are fundamental changes to the community, “he said. 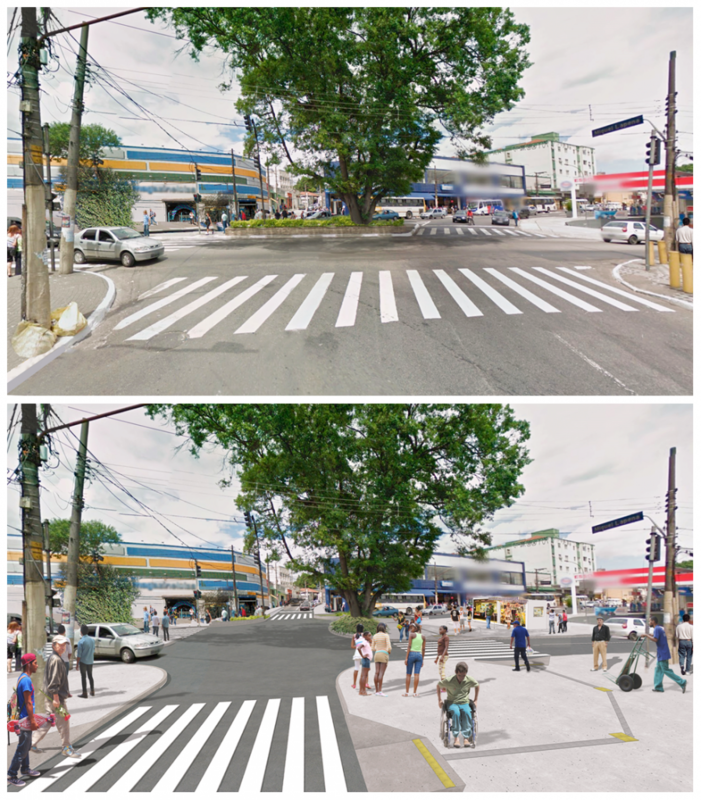 The São Miguel redesign project has two main objectives: saving lives and revitalizing a peripheral area of the city, rather than a central area that typically receives attention. “São Miguel is the region of São Paulo with one of the highest accident indexes, when considering the accident rate per square kilometer. We want to help the neighborhood change that. This is the main goal: to save lives,” emphasizes Brenda Medeiros, Urban Mobility Director of WRI Brasil Sustainable Cities, during an interview. Road safety interventions in São Miguel will be implemented in different phases. The first stage of the project involves 18 different mechanisms to improve safety for the local population. One project involves raising the crosswalk to the level of the sidewalks, easing pedestrian crossing and forcing drivers to slow down as they pass by. At a prominent roundabout, developers will work to widen sidewalks and install a bike path. In addition, the area will receive new vegetation and street furniture to make the environment more pleasant for pedestrians. 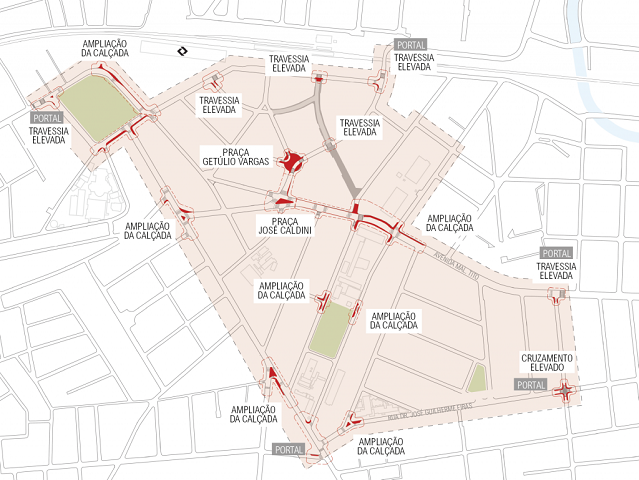 Square José Caldini, the heart of São Miguel, will also undergo a process of redesign to give more space to the people. The sidewalks will be expanded, the tree in the center of the square will be preserved and the area will receive new signs, refuge islands and street furniture to provide more comfort and safety. Measures such as these are life-saving. For example, for every meter subtracted from the distance of a pedestrian street crossing, the chance of fatality falls by six percent. For longer journeys across streets, refuge islands can reduce the number of pedestrian accidents and pedestrian deaths between 57 and 82 percent. Furthermore, when crosswalks and refuge islands are elevated to sidewalk level, ten percent of cars slowdown in the middle of the block. Originally published in Portuguese at TheCityFix Brasil.